Today, our class was up bright and early, as we were excited for our activities today. Some of us were lucky to make the bus this morning, as we chased it down the street knowing that another would not be coming for a while and that we could not be late. After getting on the bus panting and out of breath, we were on our way to our first destination: a graffiti workshop with Berlin Massive in Mauerpark. Once we arrived, we met up with Heidi, the rest of our group, and our graffiti instructors/educators Pekor and Marco. Before we could get started, Pekor spoke briefly about the history of graffiti in Berlin, as well as how the Berlin Massive came about. Many argue that the contemporary graffiti movement in Berlin was inspired, in large part, by Thierry Noir, whose art consisted of these block-like, colorful characters. According to Jonathan Jones in “Thierry Noir: The First Graffiti Artist Fired up by the Berlin Wall,” “Part of the Berlin Wall is recreated in his gallery show to try to bring to life that moment in the 80s when cracks were appearing in the edifice of the Soviet Union and its satellite states, and artists, led by Thierry Noir, were comically transforming the ugly symbol of the Cold War that ran through Berlin with a carnival of bright colours and visual gags” (22). This is important, because at that time, Noir didn’t know he was about to start what can be seen today as a social movement. There always has to be someone to take the first step, and Noir did just that. Many artists followed in Noir’s footsteps with graffiti being their form of creativity and expression. Some of these artists include Linda’s Ex, XOOOOX, Tower, Alias, and Mien Lieber Prost whose work can be found all over the city. Regarding the relationship between graffiti and the fall of the Berlin Wall, Simon Arms writes, in “The Heritage of Berlin Street Art and Graffiti Scene,” After the collapse of the Berlin Wall, the graffiti artists marched straight into East Germany…all of the areas that the military had occupied became a new playground for the Western artists and became a new world for the Eastern artists who joined them…It wasn’t that they were better artists, but they could express—with authority—the one concept close to the hearts of all people now living in the city: what it meant to be free” (2-3). Graffiti, then, became more than just a hobby; rather, it became a necessity for these artists to voice their freedom and speak against various forms of oppression, such as racism and capitalism. Another movement that exploded during this time was hip-hop. Many people of color were excluded from particular facets of German culture, and American hip-hop became a vehicle through which people of color could voice their frustrations, lifestyles, and desires. As Heinz Ickstadt writes in “Appropriating Difference: Turkish German Rap,” hip-hop especially “lent itself to becoming a vehicle of ethnic minority and allied youth protest against…discrimination anywhere. British Black and Asian, Franco-Maghrebi, German Turkish, and other bi-cultural (or rather, in view of their appropriation of trappings of American culture, tricultural) rappers in Europe are seen and heard as ‘voices from the ethnic ghetto,’ speaking out on behalf of new generations of post-migrant ‘communities’” (574). It’s important, then, that artists are able to express themselves and speak out against the oppressions they face. In keeping with this tradition, Berlin Massive was founded 11 years ago by people who wanted to express themselves and fight oppression in creative ways. They offer programs and workshops for youth and adult aspiring artists to learn graffiti, breakdance, beatbox, rap, and many more forms of hip-hop expression. They also participate in an exchange program with Italy, China, India, Russia, and other countries. Our class was fortunate to participate in today’s graffiti workshop. Pekor is a very skilled artist, and he taught us the basics of forming graffiti letters on a blank canvas. We learned how to draw the letters, fill them in, add effects, and touch them up. 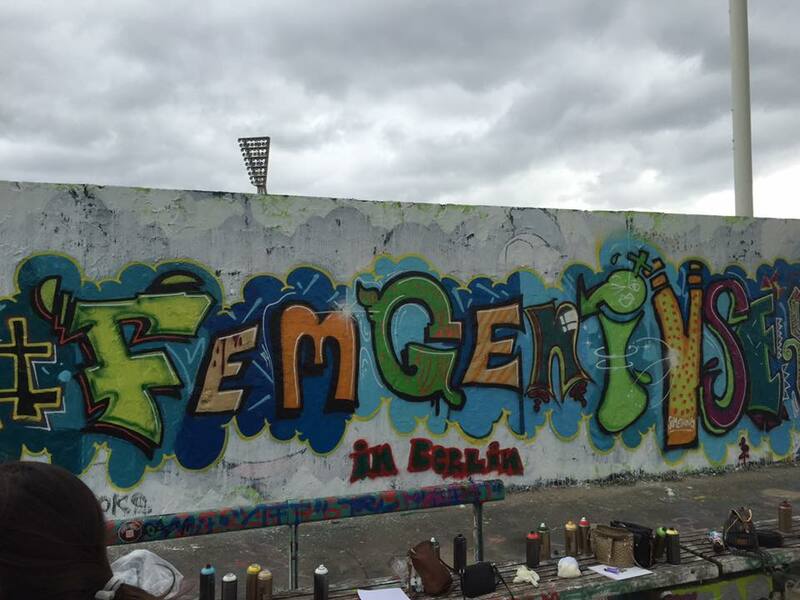 Once we finished, we created a brilliant masterpiece showcasing the hashtag for this course: #FemGeniusesInBerlin. We were very proud of ourselves and this accomplishment, considering most of us don’t come from artistic backgrounds. It felt great to be able to leave our mark on the Berlin Wall, especially at the end of what has been an amazing and educational experience. DeAira Cooper is a Chicago girl living in Colorado. She is an Anthropology major and double minor in Theatre and Race & Ethnic Studies. She enjoys acting and doing comedy, and performs all types of comedy, including short and long-term improvisation, short skits, and sketches. She also writes a lot of her comedic sketches and monologues, and enjoys singing. You can often find her harmonizing with her friends or just creating new music. She’s just a down-to-earth lady always looking for the positives in a world full of negatives. She tries to stay optimistic at all times, and because of this, you’ll probably find her with a group of people making them laugh.